Bengaluru FC booked their place into this year’s final of the Indian Super League after they defeat Pune 3-1 in the semi-final on Sunday. 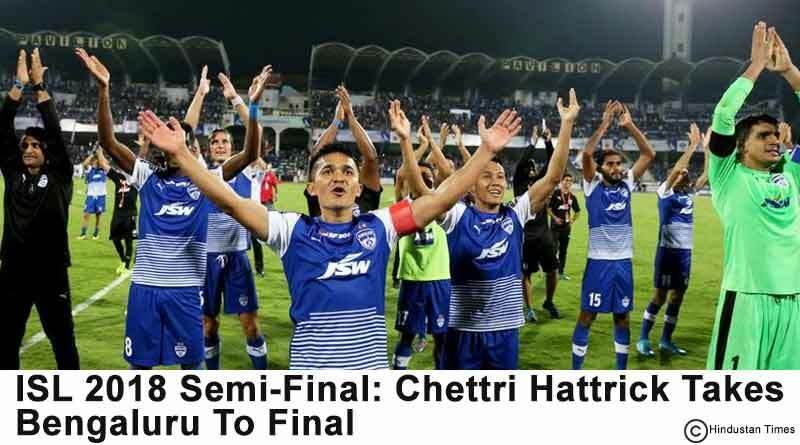 Sunil Chettri scored a hat-trick after goals by him in the 15th, 65th and 89th minutes sealed a final berth for Bangalore. Luca scored a stunning freekick for Pune to give them the consolation goal in the 82nd minute. The second leg of the semi-final between Bengaluru FC and Pune was an entertaining one as both the teams shared four goals between them in their quest to reach the final. Indian captain Chhetri opened the deadlock 15th minute after a nimble-footed Udanta Singh’s neat cross found an unmarked Chettri on the far post. Despite the poor defending by Pune, overall good play by Bangalore saw them open the scoring and take the crucial lead in the semi-final. Despite Pune’s strong attacking play in reply to going behind, they were unable to unlock their opponent’s defense who went into the break with their lead secure. The second half was much of the same with Pune starting on the front foot but failing to find the back of the net. They ended up conceding once again after they gave Bangalore a silly penalty after Sarthak Golui brought down Chettri with a push in the back of the box. Pune, however, found a foothold in the game in the 82nd minute after Luca converted a brilliant freekick to score perhaps the goal of the tournament. Going all out in attack found themselves bare defensively which eventually lead them to concede their third. Chettri once again got on the scoresheet in the dying minutes of the game to not only score his hat-trick but also deliver the killing blow to Pune with his 13th goal of this ISL season. Bangalore now await the winner of the second leg between Chennaiyin FC and Goa in the final of the tournament.